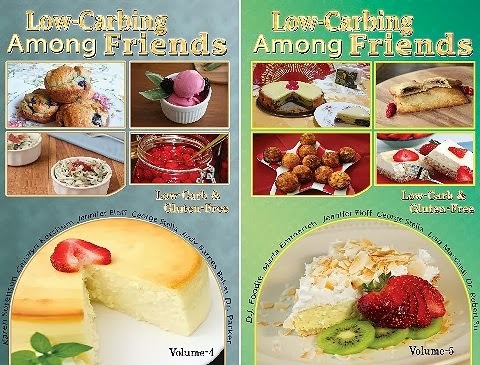 I’m happy to report that two new cookbooks from the Low-Carbing Among Friends series are available for order! All the books in the series are low-carb, sugar-free, and gluten-free. In response to popular requests, the new books have some changes. We still have an amazing group of writers and recipe developers, but the team now includes the star of stage, screen, and television, George Stella! (You have done something on stage, George, right?) Also, the recipes are now listed by category rather than by author, making them easier to navigate. Last, but not least, the new books include color pictures! Each book contains almost 200 recipes. Both books have a forward by George Stella. Volume 4 includes medical advice from Dr. Steve Parker and recipes from Jennifer Eloff, Carolyn Ketchum, Judy Barnes Baker, and Karen Sorenson. Volume 5 has Advice from Dr. Robert Su and recipes from Jennifer Eloff, Maria Emmerich, DJ Foodie, and Lisa Marshall. Both books are available in a coil-bound version.